Tracking the doors we passed through during the week. How did we come up to this idea? 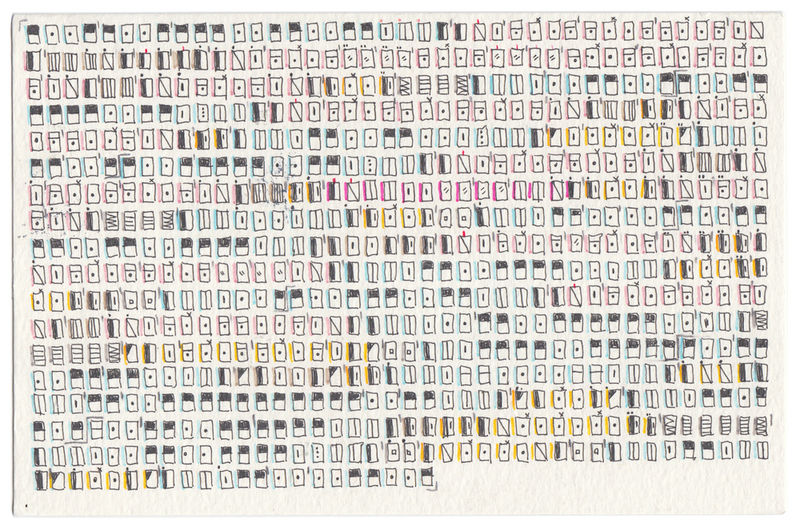 Each little rectangle represents a door I opened and / or passed through in chronological order, to enter or exit a space. The side colors indicate the main location (my building, my work place, whether it was a shop - cafe - public transportation’s door and so on); while the symbols indicates the type of door it was (external, internal, sliding doors, elevator doors, bathroom door, glass door, etc.). Drawing this card was hard, long, and frustrating. As much as I was happy about the idea in the beginning, I regretted it while drawing it: it took me forever! And my hand was hurt in the end! But I like the result I admit, it is very structured and reminds me to tiny floor-plans…! I LOVE Stefanie’s card - it is beautiful and very original, I love the colors she chose and the ways she depicted the different kind of doors she passed through. She detailed the data collection much more than me this time, and I lost myself tracking her days: from her personal space to her studio, to her doctor’s office to her friend’s houses! This week’s postcards are definitely not insightful about who we are and/or about our personalities: they are more a description of our days: the pace we enter and exit places, the characteristics of our physical surroundings. They are nice visual textures that describe our environments, and even if it’s not particularly “imaginative” I liked this exercise! Structured intuitions, and images, and numbers. I personally see data visualization as the combination of my ‘artistic’ (or, better said, emotional!) side and my rational and scientific one; I have a background in architecture and my mind needs to structure and organize information, but my eyes and my spirit need to see and invent unexpected visuals every time, I guess. I enjoy designing visual artifacts that have a logical and structural sense, I don’t take pleasure in producing graphic designs per se, I do instead take pleasure in shaping visual ways to represent quantitative and rigorous parameters. What drives me in what I do is the overlapping space between analysis and intuition, between logic and beauty, between numbers and images. It is an uncommonly exciting time for being a data visualization designer now, projects and opportunities get more and more complex and challenging, and the field of data visualization is growing and becoming more popular. We now have to find new languages, new ways of entertaining people; we have to make visuals that can become magnetic to people who are not familiar with data practices. We have amazing challenges to address: how can we keep on exploring, guessing, imagining, hunching, trying combinations and trying to inspire feelings, as visual communicators who use images and symbols rather than words and numbers? How can we be faithful to scientific accuracy while allowing space for exceptions to flourish, with the aim of bringing a range of new possibilities to the table? Gathering data on every door that we went through is obviously an idea that we had at the beginning of the project before we actually started to gather and draw data, and you can tell this by how ridiculously insane and complicated it is to actually gather such fine-grain data about one’s life. Oh, how optimistic we were then, in those early days! However, I still like the idea of capturing these unusual datasets, as I enjoy how you can still see the story of a life lived in the most unusual types of data tracking. So, since we were both up for the challenge (and we like to make things difficult for ourselves), we set off on one of the most complicated weeks of data-gathering for the project. However, for my interpretation of this week’s theme, I decided to flip things around a little bit, and focus on seeing doors as something that is dividing one space from another, so I chose to capture data on these partitioned spaces instead. I noticed that for this particular week of data tracking, it was easier for me to store large quantities of data in my mind before needing to stop and note it down. Often, I can’t pause and note data after every instance (particularly when other people are around, as they might think I’m crazy or just really annoying), so I have to mentally store the data, then write it down later. For this week of data, I could easily look back and recall quite lengthy sequences of spaces I moved through through retracing and visualising quite clearly my movements in my mind. Reflecting upon this now, I suppose it makes sense that this week it was easier for me to retain this type of information, as the creation of ‘memory palaces’ has been a way of storing and recalling information in one’s mind for aeons. I like this, as it’s just another unexpected benefit of this year-long project: while of course we are slowly refining our data-gathering and data-drawing technique, I didn’t ever realise that I would also find new ways of noticing, and remembering, and being aware of my life as I pass through it. This is quite a simple card, in that it is pretty much just referencing the idea of doors as a flat partition between two spaces, and, to be honest, has a level of complexity for a drawing that I could feel I could fit into my life for that (busy) week… I chose a less-complicated drawing option to cut myself some slack, since the data was more complicated. However, I do still like this drawing because it references tally marks, and I have a particular affinity for tally marks as an example of an ancient (but-still-in-use) system of notation and counting. With such a simple drawing approach, I focused my efforts on working with the colour palette more carefully than I normally do, clustering different types of spaces by colour so it was easier to see general patterns on the card. However, while I was drawing this card, I could see that it was difficult to differentiate between different tones of the same colour, so I started to add a texture of cross-hatching to some of the lines to ‘fix’ my card and make it a little more legible. As we’ve moved through this year, I’ve realised that I enjoy the spontaneous part of the drawing process, where I problem-solve as I draw, often changing my concept or adding different decorative elements, watching my card evolve in an unexpected direction. I know this is part of the process for a ‘proper’ illustrator, but for a data-centric designer who always plans everything in advance, i’ve become more appreciative of having a chance to potter and play, and explore drawing in a more spontaneous fashion. So, imagine my frustration when the card didn’t arrive in Giorgia’s mailbox! I had to draw the whole card again, taking into account all of the spontaneous decisions that I had made before and re-drawing them relatively precisely: this wasn’t as much fun, so I think from now on, if a card goes missing, we are allowed to refine and tweak the drawing slightly so the process is an enjoyment rather than a chore. Of course, Giorgia never ceases to amaze me with the level of complexity of the data she gathers and draws. I love this drawing that Giorgia has created this week, it’s so beautiful in its complexity, and while we both worked to the same theme, I prefer her card because it focused on the actual doors in such detail. Through this focus, this card draws my attention to a part of life that is so small, and mundane, and overlooked, and forces me to reflect upon it with fresh eyes. In my opinion, this is what a good artwork should do, and this is also why I work with data: to highlight the hidden patterns in parts of the world that often go unnoticed. This card is a definite favourite. Ha, I wonder if her uttering those words jinxed us, and this was the reason that my card didn’t show up, because of course one would go missing after someone said that, right? It’s the law of the universe! Giorgia's arrived in one piece! Posting from my lucky Brixton mail slot. It obviously has magical powers, because cards always arrive from here.